Recently I was sent something most astonishing from my peripatetic philosopher friend Robert Garmong. It is the actual obituary of Friedrich Nietzsche as published in the New York Times on August 26, 1900. Now, my understanding of Nietzsche from my undergraduate days, and some of what I’ve read about him from Kaufman, led me to believe that he didn’t get famous until much later than this, but the obituary treats him as fairly well known. Check it out. Weimar, Aug. 25.–Prof. 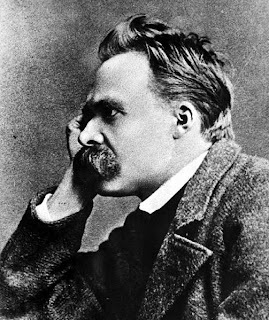 Friedrich Wilhelm Nietzsche, the philosopher, died here today of apoplexy. Prof. Nietzsche was one of the most prominent of modern German philosophers, and he is considered the apostle of extreme modern rationalism and one of the founders of the socialistic school, whose ideas have had such a profound influence on the growth of political and social life throughout the civilized world. Nietzsche was largely influenced by the pessimism of Schopenhauer and his writings, full of revolutionary opinions, were fired with a fearless iconoclasm which surpassed the wildest dreams of contemporary free thought. His doctrines however, were inspired by lofty aspirations, while the brilliancy of his thought and diction and the epigrammatic force of his writings commanded even the admiration of his most pronounced enemies, of which he had many. Of Slavonic ancestry Nietzsche was born in 1844 in the village of Rocken, on the historic battlefield of Lutzen. He lost his parents early in life, but received a fine education at the Latin School at Pforta, concluding his studies at Bonn and Leipsic. Although educated for the ministry, Nietzsche soon renounced all faith and Christianity on the ground that it impeded the free expansion of life. He then devoted his attention to the study of Oriental languages and accepted in 1869 a professorship at the University of Basel, Switzerland. This position he held until 1876, when overwork induced an affection of the brain and eyes, and he had to travel for his health. During these years of suffering and while in distressed circumstances he wrote most of his works. Since 1889 Nietzsche had been hopelessly insane, living in Weimar, at the home of his sister, Elizabeth Forster-Nietzsche, who has edited his works. For many years he was a close friend of Richard Wagner, the composer. His principal publications are “The Old Faith and the New,” “The Overman,” “The Dawn of Day,” “Twilight of the Gods,” and “So Spake Zrathustra,” which is perhaps the most remarkable of his works.